Two years ago, together with former colleagues at the Institute of Development Studies (IDS) and supported by the School of International Futures (SOIF), I worked on a research project that used foresight tools to explore ‘knowledge sharing in the digital age’. The ‘foresight approach’ involves a range of methods for getting perspectives on the future and creating a roadmap to inform policy and practice. We were looking 15 years ahead and engaged with a range of stakeholders, mainly from the African context. Through workshops and interviews we identified key drivers of change and used the foresight tools to describe different imagined scenarios. The result was policy recommendations for achieving preferred outcomes in a world characterised by the freedoms which we would like to enjoy. In this briefing, I have chosen to revisit this topic as a short ‘thought piece’. ICTs play an ever-increasing role in supporting innovation and in how knowledge is created and shared. Our society is being reshaped for better and for worse, and the effects of ICTs are not neutral. For almost any ICT you can name, there are good and bad affordances. For example, take the role of drones in gathering data: we can celebrate some aspects of the role they can play in collecting life-saving information in a disaster situation such as the Nepal earthquake in May 2015. We can also resent and challenge the intrusiveness, invasion of privacy and danger to air travel that can result if their use is not regulated. However, if the information they can help to gather is not made freely available, and simply supports powerful people in wealthy organisations or governments, then what are the implications for future generations? The digital divide exists within a daunting set of growing inequalities related to economic opportunity, power and knowledge. The ways in which knowledge is mediated and made available in our society is having a major impact on these other divides. Mediation itself takes place in different ways between people, between people and ICT devices, and between ICT devices. The last category may sound surprising, but in a world where we now refer to the ‘internet of things’ and some of those ‘things’ themselves reflect growing ‘artificial intelligence’, it could be argued that knowledge can increasingly be developed by, and shared between, technology based non-human objects. In simple ways, and without artificial intelligence driving it, we already see music devices and gadgets updating their software, and home devices such as Amazon’s Alexa products, playing a role in both mediating communication, and pushing and pulling information between the human world and the online repositories of digital files and products. Support ‘Openness’. Open models are discussed in the book Open Development (Smith and Reilly, 2013). These approaches have their challenges and total openness is likely to be unachievable, as systems are rarely totally open. However, open approaches support a different knowledge economy agenda that is more inclusive, accessible and aimed at addressing inequalities. Advocate for ‘Net Neutrality’. This principle and why it is so important is explained effectively in YouTube videos by Common Craft and Now this. Retaining total net neutrality may not be realistic. However, the principle of equitable access to internet based services is one of huge significance in determining how the internet develops and how knowledge is created and shared. If net neutrality is sacrificed, inequalities in terms of access and usage will flourish in the digital world. Develop skilled and trusted ‘knowledge intermediaries’. More and more information is held digitally. It is increasingly challenging to validate and assess the quality of what is found on the Internet. Skilled data scientists and information management professionals are in a sense the new librarians. We need trusted experts who work to provide knowledge as a public good for civil society, so that we can hold governments and big corporations to account, and access knowledge openly that enables us and our children to gain the best education and quality of life that we can. We face what at times appear to be irresistible and negative forces, where freedoms are under threat and security and surveillance is growing. Yet, the world is now a far more connected place, and writing this in Yangon, I reflect that the scope for interacting with and learning from people, from diverse locations, cultures and backgrounds, is growing day by day. As ordinary people develop connections through their use of ICTS, they can seek to be more empowered and create an open movement and strong voice that can help lead us all to a brighter future. 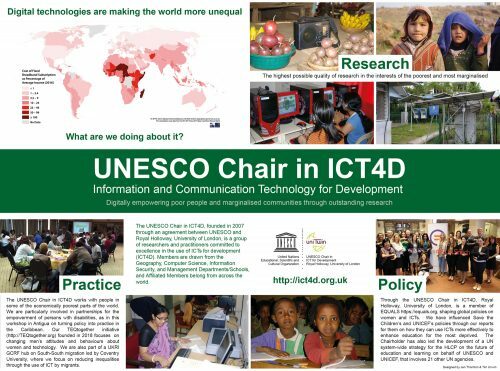 The ICT4D community is well placed to ensure that ICTs are used for future good. I recommend developing skills in the foresight approach as a means to understand and shape the future. In some of my own work with Development Dreamers I have been experimenting with lighter versions of the foresight approach and will be happy to network and collaborate with others who have an interest in this. In June, together with more than 500 experts in Artificial Intelligence (AI), I participated in the “AI for Good” Global Summit. Organised in Geneva by the ITU and the XPRIZE Foundation, the summit focused on a crucial and timely question: Can AI contribute to achieve the 17 Sustainable Development Goals that the UN has set to end poverty, protect the planet and ensure prosperity for all? As an expert in automated decision-making, I know first-hand that AI is a uniquely powerful and transformative technology. AI can have a huge impact not only to further the progress of the wealthy countries, but also to foster the advancement of developing nations. For example, AI can teach people new skills and support lifelong learning. At the same time, the development of AI raises ethical and societal challenges for AI experts and policy-makers, who share the responsability to deploy an AI technology that is safe, reliable and fair. Why is AI so special? As observed by Stephen Cave during the Summit, AI is a tool different from any other because of three crucial aspects: (i) AI is a universal tool, which will be soon incorporated in all other technologies (e.g. self-driving cars, smart homes, robotics, personalised medicine); (ii) AI can accelerate its own development, besides the development of other tools (e.g. machine learning is an AI tool that can improve itself as well as other AI algorithms); and (iii) AI is autonomous (AI agents make and implement decisions without constant human intervention). In addition, AI is based on data, which are often collected from people and contain sensitive information about them. Considering all these factors together, it becomes clear why AI generates excitement but also concern. In the last few years, I have focused on the development of UAVs (unmanned aerial vehicles) for surveillance and disaster response applications. I have formulated techniques based on task planning and probabilistic reasoning to make UAVs smart enough to fly autonomously and strategically to achieve sophisticated goals specified by domain experts over a large geographical area and a long temporal horizon. The potential of intelligent vehicles in emergency scenarios is enormous as resources are limited and time is critical. However, these are challenging situations in which decisions can have a life-changing impact and human operators need to trust the machines and understand their behaviour. Transparency: users need to be able to inspect and verify the algorithms and data used by the system to make and implement decisions. I would like to conclude with a provocative remark that Professor Gary Marcus brought to the table during the Summit and that I share: are we really so close to Strong AI as many people seem to think, where “Strong AI” means a system that exhibits integration between all aspects of intelligence: common sense, planning, reasoning, analogy, language and perception? I believe that, although AI can truly change the world, we still need fundamental advances first. Key to achieve them are interdisciplinarity and global collaboration. In particular, I would welcome multi-disciplinary collaborations to make UAVs and drones truly effective in disaster response scenarios.